So, the second of this grand (some might say seminal) series has been delayed by a very unfortunate discovery. See, the common-or-garden cake is not the only baked good the cukraszda has to offer. On worse for wear mornings – of which, due to the thoroughly clement pricing of boozables around these parts there are a few – one naturally prefers the soothing combo starch n’ carbohydrate to confectioner’s cream, egg custard and the like. Thus, one would choose the scone-ish pogácsa, a cannon ball of salty pastry topped with cheese or similar. Some days ago, Joe discovered that these leadweight carb-bombs featured pork fat shortening pretty high up on their list of ingredients. Therefore, in the attempt to retain what is left of my hard-won vegetarianism (for I have no doubt that I am inadvertantly absorbing pork fat by osmosis most days), myself and the pogi-for-short can no longer be friends. As far as cake goes, however, things are still grand (and if they’re not, and, in fact there are morsels of duck tail studded through every one, please don’t tell me). Today is Mikulás, which I shall post about at length later. Suffice to say, excitement levels at Kazinczy utca 7 were pretty high – this not only being something a bit like an extra Christmas but also the kind of aimed-at-children tradition-fest with a PG-rated folktale backstory that I’m a total sucker for. Occasion enough, then, for a trip to Muvesz, the fin-de-siecle, confectioner’s cream paradise that I may (ahem) have mentioned previously. 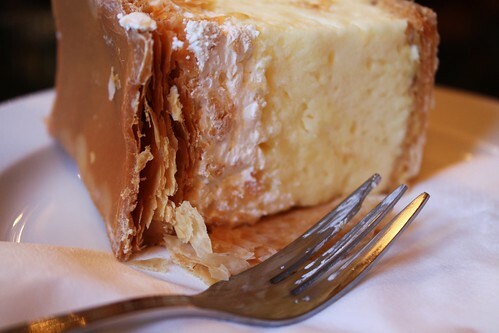 I had francia kremes, a tower of pastry, egg custard, confectioner’s cream and caramel glaze which is now, I’m almost certain, my very favourite cake.